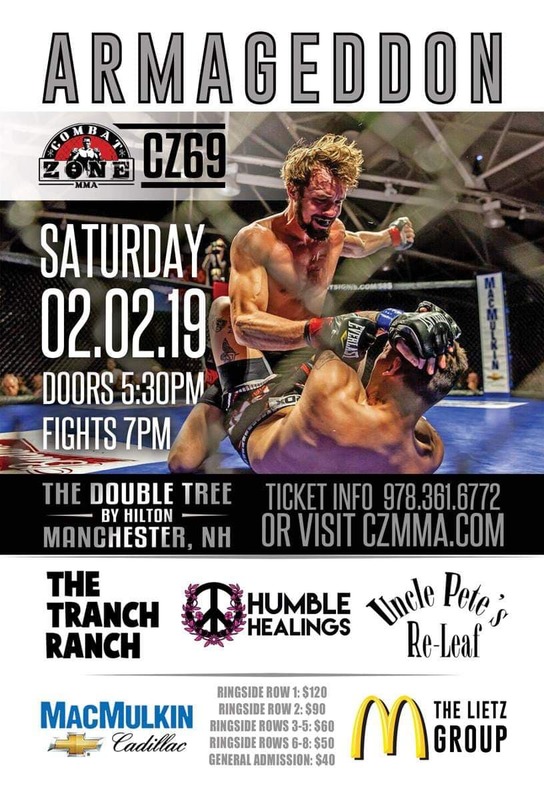 Manchester, New Hampshire - Combat Zone 69 follow along throughout the evening as we are cage side there at the Dobuletree in downtown Manchester, New Hampshire as we anticipate the start of Combat Zone 69: Zacharia-Smith v. Spero. First bell sounds just after 7pm. Round 1: Here. We. GO! Reynolds comes out with a couple low leg kicks and Able catches one and dumps him on the ground and looks for the back but is too high, they scramble to the feet. Able catches the kick again and the are back on the ground but return back to striking distance briefly before Reynolds lands a take down and they scramble on the mat with both fighters looking for finishes as round one ends. 10-9 Able. Round 2: Reynolds comes out kicking again and Able counters with come hands, Able catches Reynolds coming in and sits him down but Able lets him back up and Reynolds grabs a double leg against the cage and is in top control working his way to side control. Reynolds gets to mount and lands some heavy ground and pound that earns the stoppage from referee John English. Decision: Jeff Reynolds defeats Isaiah Able by TKO (Ground and Pound) at 1:49 of round number 2. Round 1: Justin comes out behind the jab as Brady looks to tie him up and they go to the mat where Brady looks for a guillotine but ends up on bottom. Justin is defending well and breaks the choke and has Brady mounted and lands some ground and pound before Brady can return to guard, Brady throws up the triangle but Justin breaks that as fighters exchange blows as the round ends. 10-9 O’Connor. Round 2: Brady lands first in the second but O’Connor ties up and lands heavily to the body before taking Brady down and getting Brady in a crucifix with a lot of time to work and he is in his corner with Joe Lauzon walking him through the exchanges. O’Connor starts raining down some heavy hammerfists as Brady looks to escape the pressure. Brady pushes off and looks to get up but O’Connor pounces and keeps him on the ground as the round ends. 10-9 O’Connor. Round 3: O’Connor comes out with a overhand right and some heavy body shots that back Brady up and Justin pounces on top postures up and lands some heavy ground and pound for the referee’s stoppage. Round 1: Mohammad strikes first and is looking to use his length to strike from outside and Mohammad is landing some heavy combinations and lands a single overhand right that gets McAndrews attention. Al Kinani is landing some heat with a heavy right hand that threatens to end this fight early. Al Kinani is putting on a striking clinic, he lands a superman punch followed by a barrage that drops McAndrews as the round ends and McAndrews needs directions to his stool. 10-8 Al Kinani. Round 2: Mohammad lands a low leg kick that crumbles McAndrews and Mohammad starts round 2 like he finished round 1 hurting McAndrews on the feet. McAndrews shows some life and lands some combinations of his own but they are immediately answered by Al Kinani. Mohammad is landing kicks to the body and is battering McAndrews until the bell sounds. 10-9 Al Kinani. Round 3: Kicks from McAndrews miss to start round 3 as Al Kinani uncorks a barrage that sits McAndrews down but McAndrews scrambles to top control and is looking to do work from the top. McAndrews keeps top control for the remainder of the round landing some short blows but no big damage….this was a war! 10-9 McAndrews. Last fight: First round Submission (Triangle Choke) of Jesus Cintron at Combat Zone 67. Last fight: First round Submission (Rear Naked Choke) loss to Evan DeLong at KOTC: Starbound 2. Round 1: Jay comes out with a combination that touches Alley but Nick clinches up and takes Ellis to the ground. Ellis scrambles to his feet but Nick hops on the back and sinks in the Rear Naked Choke...Jay fights the hands but Nick sinches the choke tighter for the tap. Decision: Nick Alley defeats Jay Ellis by Submission (Rear Naked Choke) at 1:17 of the first round. Last fight: Second round Submission (Armbar) of Chad Kelly at Combat Zone 67. Last fight: Unanimous Decision victory over Zachary Burhans at CES 53. Round 1: Andy takes the center of the cage and lands the first combination of the fight. Andy lands a thunderous body shot as he continues to stalk Silva from the outside. Andy fires off a combination that opens Silva’s forehead and blood pours from the cut. John English stops the fight to get the recommendation from the doctors and the doctor calls this fight off. Silva passes out in his corner from the blood loss. Decision: Andy Aiello defeats Jeff Silva by TKO (Doctors Stoppage) at 1:41 of round 1. Last fight: Unanimous Decision victory over Jahnell Parkinson at Combat Zone 68. Last fight: First round Submission (Rear Naked Choke) loss to Gerald Meuse at Combat Zone 68. Round 1: Cintron comes out throwing leather but Terrance is backing him down and Terrance grabs Cintron and slams him to the ground, Terrance mounts and rains down heavy ground and pound for the referee’s stoppage from Alan Lou. Decision: Terrance Jean-Jacques defeats Jesus Cintron by TKO (Ground and Pound) at 1:05 of the first round. Last fight: Unanimous Decision victory over Jeff Perez as Combat Zone 63. Last fight: First round Knockout loss to Randy Costa at Cage Titans 42. Round 1: Murphy comes out light on his feet dodging the wild shots of Fuller. Kenny gets the double leg but they scramble to their feet. Kenny wastes little time on the feet as he lands another double leg and mounts Fuller, Fuller gives up his back and Kenny lands some heavy strikes before sinking in the Rear Naked Choke for the tap. Decision: Kenny Murphy defeats Rob Fuller by Submission (Rear Naked Choke) at 1:48 of the first round. Last fight: First round Knockout of Rob Fuller at Combat Zone 67. Last fight: Unanimous Decision loss to Ernesto Ornelas at NEF 33. Round 1: Carl comes out with a low leg kick that cracks Andres and Andres comes back with a combination as fighters gain their bearings early. Andres clinches up with Langston and they go back and forth in the clinch on the cage with Carl looking to change levels for the takedown, but they separate. Fight returns to striking distance and Carl lands a body kick and a high kick but Andres clinches and looks for a throw but Carl stuffs and they are on the cage again. They split and Carl throws a front kick and follows with a low leg kick. Carl fires another kick and Andres clinches again. We return to striking distance as round one ends. 10-9 Langston. Round 2: Carl comes out with more kicks to start round 2 but nothing to really test the chin of Andres. Langston shoots for a double leg but Andres stuffs and nearly eats an elbow on the break. Andres finally lands a paid of overhand rights that get Carl’s attention as they stand as striking distance. Carl lands a nice kick to the body and is answered by a right hand from Andres. Carl fires some more glancing kicks but nothing to test Rodriguez’s chin. Fighters exchange low kicks and strikes as the round ends. 10-9 Langston. Round 3: Andres comes out with the kicks in the third and follows up with an overhand right and some knees in the clinch. Andres catches a kick and looks to dump Langston but Langston stuffs the attempt and they clinch on the fence again, where Langston turns the action. Langston changes level looking to score the takedown and secure the win, Andres makes Carl pay with some elbows but the action is stalling. Alan Lau breaks the action and they return to striking distance as the fight comes to an end. 10-9 Langston. Decision: Andres Rodriguez defeats Carl Langston by Split Decision…..
Last fight: Second round Submission (Kimura) of Justin Boraczek at Combat Zone 67. Last fight: First round Submission (Rear Naked Choke) of Sean Seaburg at Combat Zone 50. Round 1: Duncan comes out with a headkick and Spero takes him down and had Duncan on the fence but Duncan uses the fence to get to the feet and turn the action landing some knees before Spero lands another takedown. Spero has Duncan mounted and lands some ground and pound and Duncan gives up his back and Dave Spero sinks in a deep Rear Naked Choke for the tap. 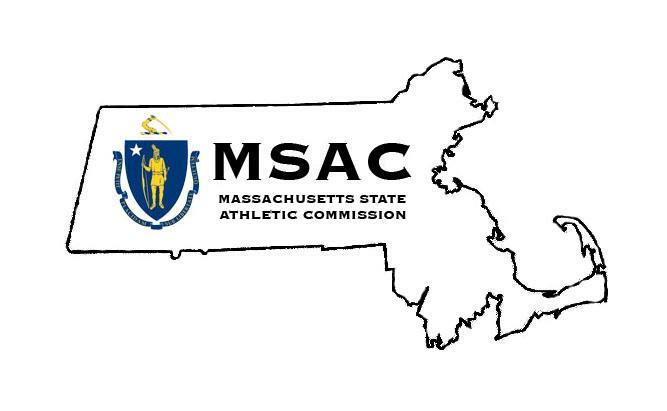 Decision: Dave Spero defeats Duncan Smith by Submission (Rear Naked Choke) at 2:00 of the first round. Dave Spero becomes the new Combat Zone Amateur Welterweight Champion. Dave Spero retires the newly crowned Champion!